There are 25 Assisted Living Facilities in the Spanish Fork area, with 3 in Spanish Fork and 22 nearby. The average cost of assisted living in Spanish Fork is $2,598 per month. This is lower than the national median of $3,346. To help you with your search, browse the 112 reviews below for assisted living facilities in Spanish Fork. On average, consumers rate assisted living in Spanish Fork 4.6 out of 5 stars. Better rated regions include Mapleton with an average rating of 4.8 out of 5 stars. Caring.com has helped thousands of families find high-quality senior care. To speak with one of our Family Advisors about assisted living options and costs in Spanish Fork, call (855) 863-8283. Spanish Fork is a city in central Utah and forms part of the Provo-Orem Metro Area. Home to the annual Festival of Lights and other large-scale events, it is an attractive, vibrant place for seniors who love festivities. It has a fairly young population, though, with a median age of 25 and only around 5.5 percent of residents are 65 years and over. Three assisted living facilities provide senior care services within the city while 22 others in nearby areas serve as alternative options. Utah's Bureau of Health Facility Licensing, Certification and Resident Assessment, under the Department of Health, is responsible for regulating ALFs in Spanish Fork and the rest of the state. Compared to Utah’s 118 and the Provo-Orem Metro area’s 119, Spanish Fork registers a slightly lower cost of living index of 114. Grocery is the lowest at 91, which translates to more affordable food and supplies for seniors’ daily needs. Air quality is a major consideration for seniors seeking residency in Spanish Fork, especially for those prone to respiratory illnesses. The Salt Lake-Provo-Orem area ranks 18th and 8th in the most polluted cities list for ozone and short-term particle pollution, respectively. Spanish Fork is a relatively safe place, with violent and property crime rates of 19.8 and 26.5 respectively. With 100 as the highest crime rate indicator, these are better figures than the state’s 22.2 and 48.7 and the country’s 31.1 and 38.1. Spanish Fork has few facilities from which to choose in the event of a medical emergency or illness, with the nearest major hospital located in Payson City, Utah. The Social Security retirement benefits, pension income and income from retirement accounts of seniors in Spanish Fork are covered by the state's 5 percent flat income tax. Although seniors are entitled to a small credit, this places a substantial dent on their savings. The Spanish Fork Senior Citizen Center offers various activities for socializing, helping seniors maintain healthy, active and productive lives. With a minimal donation, residents 60 years and over can avail themselves of the center's congregate meals, inclusive of bus transport services from surrounding areas. Assisted Living costs in Spanish Fork start around $2,598 per month on average, while the nationwide average cost of assisted living is $4,000 per month, according to the latest figures from Genworth’s Cost of Care Survey. It’s important to note that assisted living rates in Spanish Fork and the surrounding suburbs can vary widely based on factors such as location, the level of care needed, apartment size and the types of amenities offered at each community. 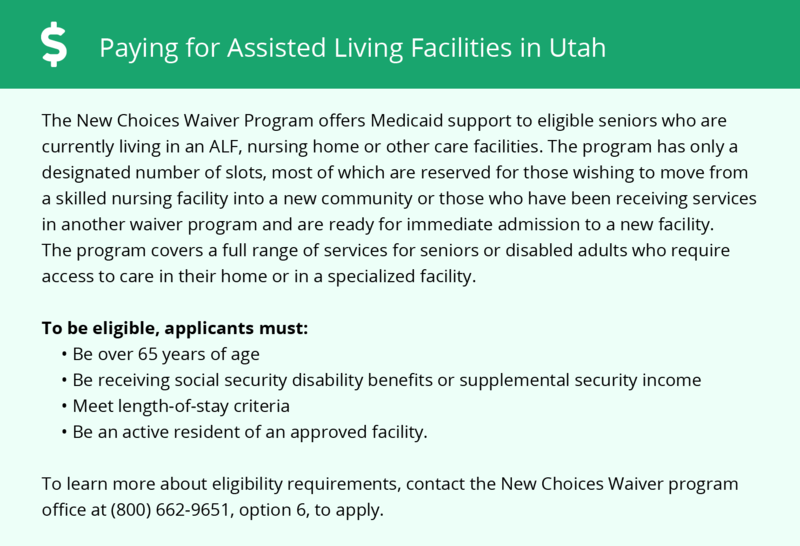 Utah’s Department of Health has a New Choices Waiver program that offers supportive services through Medicaid and helps seniors in the state and Spanish Fork with community-based living. 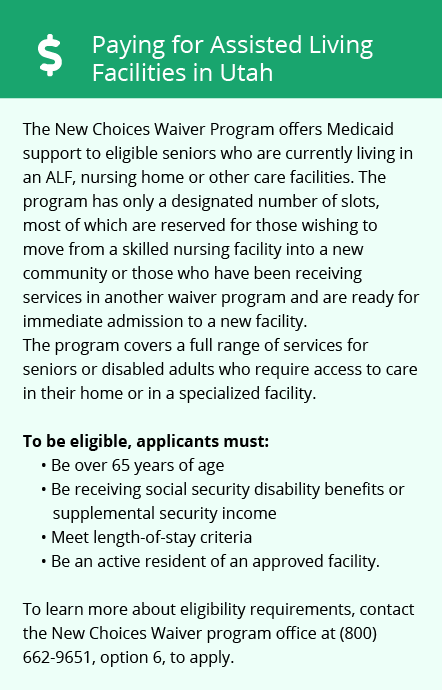 Services covered by the program include adult day care, adult residential services and other services that an enrolled senior has been assessed to need. Spanish Fork and the surrounding area are home to numerous government agencies and non-profit organizations offering help for seniors searching for or currently residing in an assisted living community. These organizations can also provide assistance in a number of other eldercare services such as geriatric care management, elder law advice, estate planning, finding home care and health and wellness programs. To see a list of free assisted living resources in Spanish Fork, please visit our Assisted Living in Utah page. Spanish Fork-area assisted living communities must adhere to the comprehensive set of state laws and regulations that all assisted living communities in Utah are required to follow. Visit our Assisted Living in Utah page for more information about these laws.